Borchert, Jane Willson, age 94, of Scandia, passed away Friday evening, Nov. 11, at her home at Cedarcliff, on the St. Croix River, in the company of her children and grandchildren. She treasured her many friends and neighbors, who enriched her life. She has touched all our lives in wonderful ways, and her memory will live on. Jane was born in 1917 in St. Paul, Minnesota to Edwin and Gertrude Willson. In 1919 her family moved to Fargo, and later to Bismarck, where Jane graduated from high school. She graduated from Michigan State University in 1939 with a degree in Home Economics, then taught high school in North Branch, Michigan and Carrington, North Dakota (Jane Willson biography). In the summer of 1941, Jane met John Borchert, a geologist working in the newly opened Williston Basin oilfield. It was love at first sight, and they married the next spring in Cambridge, Mass., where John was an Army Air Force cadet training in meteorology at M.I.T. John served in England during World War II, while Jane waited it out in Bismarck (The War Years). After the war, at Jane's suggestion, John checked out the Geography Department at the University of Wisconsin (The Madison Years). This eventually led to a distinguished academic career for him, as well as a rich and complex life for Jane; homemaker, community activist, world traveler, academic support system, environmentalist, bridge enthusiast, mother, and more. The family moved to St. Paul in 1949 when John became a geography professor at the University of Minnesota, and settled in Golden Valley in 1950, where they lived for twenty years and raised a family. In 1970, they built their dream home on the bluffs of the St. Croix River in Scandia, Minnesota, where they lived the rest of their lives. Jane was preceded in death by husband John in 2001, and is survived by her children, Dianne, William, Robert, and David, 15 grandchildren, and 11 great-grandchildren. She was active in many local, state and national organizations during her life, including the League of Women Voters (President, Golden Valley chapter), Kappa Kappa Gamma Sorority (President, Minnesota chapter), The University of Minnesota Faculty Womens Club (President), and the St. Croix River Association (President). A memorial gathering will take place at the Borchert home at Cedarcliff, (23239 St. Croix Trail, Scandia MN) on Sunday, December 11, from 1:00 to 5:00 in the afternoon. It will be an informal time for sharing, and celebrating Jane's life. Directions and additional information are available online at www.borchert.com/jane. Memorials may be sent to the John R. Borchert Map Library Endowment Fund, at the University of Minnesota. 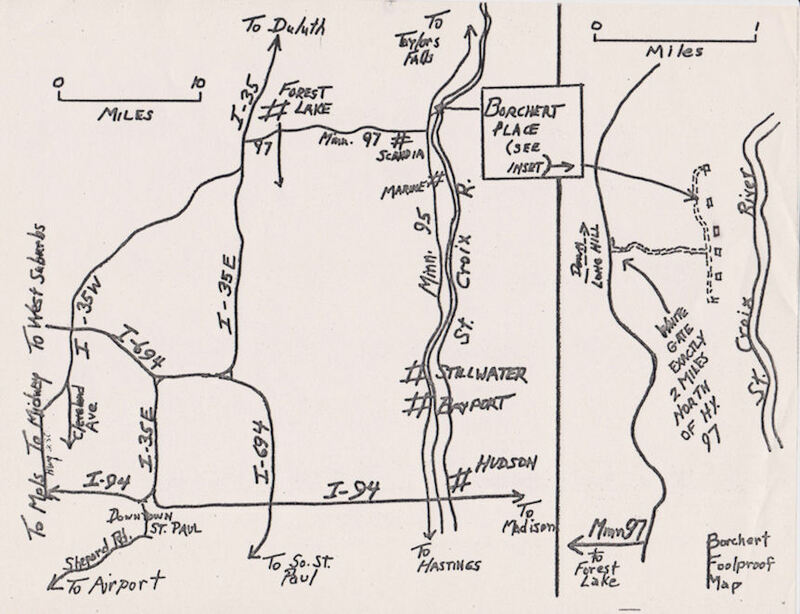 Click here for map to Borchert home at Cedarcliff (John R Borchert cartographer).